Eczema is said to be incurable by the medical establishment, but is this really true? Just what is eczema? Eczema is defined to be an inflammatory skin condition that in acute stages is accompanied by vesiculation, where vesiculation is defined as the formation of vesicles. Vesicles are blisters filled with fluid. When we consider the various types of pathogens or parasites that attack the body, namely protozoans, worms, bacteria, viruses, and fungus, we are more likely to make an educated guess as to its source. Since there is no evidence of protozoans or worms present, we can rule them out. If eczema was bacterial or viral, it would be fairly easy to eliminate, but eczema stubbornly resists anti-bacterial and anti-viral agents. This leave fungus as the main culprit. Fungus becomes well entrenched into its host, and as a result, is very difficult to remove. This is true for virtually all types of fungus. It is known that it takes 60 days just to get rid of toe fungus if treated properly. What if Eczema is Caused by a Fungus? Itching is a hallmark of eczema. It is known that fungus emits enzymes to destroy its host, and that it is these enzymes that cause extreme itching in the patient. Itching can be eliminated in one of two ways – either feed the fungus or kill it. Putting alcohol on the skin would feed the fungus, as fungus loves alcohol (technically, a sugar). Fungus can only be killed in layers. Think of fungus as an onion with several layers. It is this property of fungus that makes it so difficult to eliminate. Assuming eczema is caused by a fungus, then the obvious way to eliminate it is to make use of anti-fungal agents. Since not all fungus are created equal, some of them may be resistant to certain types of anti-fungal agents. Therefore, the scientific method would be to evaluate various anti-fungal agents to see how effectively they destroy the source of the eczema, both internally and externally (or both). Fortunately, all this research to determine which anti-fungal is effective against eczema is unnecessary as some sufferers have already run across a viable solution. The answer to eczema is the anti-fungal agent Aloe Vera. What is important to know is that the Aloe Vera is more effective taken internally than by applying it externally to affected areas. I have personally witnessed a long-term eczema sufferer solve her eczema problem taking Aloe Vera internally, and with quick results. She didn’t even need to apply Aloe Vera to her skin. For eczema sufferers, diet changes are in order. A poor diet allowed the growth of the fungus causing and promoting eczema in the first place. A good place to start is to go with the Atkins diet, which you can look up on the Internet. Essentially, it means cutting back on carbohydrates and sugars. Also important is to adopt a more alkaline diet (see my blog on The Importance of an Alkaline Diet). Fungus does not like alkalinity, and ceases to function above a pH of 7.4. You might say that the fungus goes into remission at this pH level. When exposed to a pH of 8.0 or above, the fungus is actually killed. A high pH is bad news for fungus, because fungus reproduces through the anaerobic (oxygen-free) process of fermentation. A high pH translates to injecting high levels of oxygen, thus causing the fermentation process to cease. Since fungus depends on fermentation for survival, stopping the fermentation process starves the fungus. Don’t blindly listen to doctors – they are fallible humans just like the rest of us. Don’t believe them when they tell you there is no cure for eczema. What they should be saying is that THEY don’t have a cure. Other people have been able to cure themselves of eczema and other health problems. 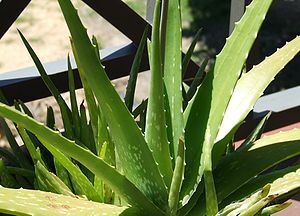 This entry was posted in Health and tagged Aloe, Aloe vera, Aloevera, Antifungal medication, Conditions and Diseases, Eczema, Fungus, health, outoftheboxremedies.com, PH. Bookmark the permalink. Thanks for re-blogging my post. I’m honored! I don’t look like the photo above, but I have had unexplained itching and minor skin issues for several years. While following the Whole30 plan I realized how much sugar I had actually been consuming before the Whole30, and I decided to additionally eliminate all fruits. The itching came back as soon as I reintroduced 2-3 fruit servings/day. Although I don’t think it is eczema, having a fungus is beginning to make great sense. I will try the Aloe Vera internally and see what happens. Thanks so much for sharing this at this time! It is most likely fungus that is causing the itching, and is probably a fungus type other than the kind that afflicts eczema sufferers. I have an excellent external remedy for this problem as well; it is listed as a Toenail fungus eliminator, but it will route out any type of fungus. See outoftheboxremedies.com for ordering. Can you take the toenail fungus internally? Or only apply it topically? The Toenail Fungus Remover is much too strong for internal use as it contains a 30% Zinc Chloride solution. A Zinc Chloride solution for internal use would need to be less than a 5% concentration. If you desire a special formulation for internal use, just contact me at yburket@gmail.com and let me know. Yes, Aloe Vera was so good that it was used by the ancient Egyptian Queen Cleopatra and was the secret of her smooth skin. I’ve used it myself on a cut for fast healing. You can add Stevia sweetener to Aloe Vera to counteract its bitter taste. I like to think that I can create a masterpiece once in a while! I’m glad the Aloe helped you. I’ve always been a fan of Aloe Vera. It is also anti-cancer! I’ve used it to successfully heal surface cuts. Thanks for linking to my article, and best of luck for your business. Do you use the skin of the aloes as well or just the fleshy white part to swallow? You discard the green skin of the aloes and only eat the fleshy white part. It would also be a good idea to apply it externally as well, although it is not necessary (hitting the problem from both sides). I hope it helps you. Just wanted to share before I knew about this article I started using aloe Vera after a bad case of sunburn 100% natural. I had horrible eczema on my hands and awoke the next morning to feel no itching on my hands. I started using that and also coconut oil. The difference is amazing. Before my hands were cracked and bleeding, now they are soft. I still get flair ups and I use the aloe immediately. Once its gone I use coconut oil to soften my skin and I found no,bleeding. My husband used the aloe on his athletes foot but found vinegar worked better. For the first time in years his feet aren’t bleeding and he uses it regularly. I have successfully used baking soda mixed with coconut oil to prevent the re-occurrence of foot fungus. Vinegar is good for getting rid of warts, I’ve also discovered. But to get rid of fungus initially, you need something stronger, namely Zinc Chloride (30%). This is provided in the Toenail Fungus Remover.